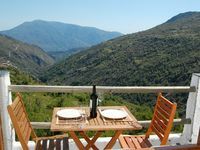 Apartment and terrace with stunning views in Bubión, Las Alpujarras. Property 4: Apartment and terrace with stunning views in Bubión, Las Alpujarras. Luxury apartment with stunning vistas. Property 34: Luxury apartment with stunning vistas. We loved Capileira - could not get enough of the incredible view and the charm of the town. It was a wonderful chance to get away and relax. The hiking was fantastic. The apartment was comfortable and great value for the money. Love to go back one day. Lorraine and Rob are wonderful hosts - welcoming, generous with their time and knowledge of local beaches and Granada. Their house is very comfortable, and superbly situated for a beach/Granada holiday. Thank you! !